My experiences in web development, gaming, and technology. Quite often I find myself needing to use a server variable in a SharePoint data view web part. These are very useful for getting information that would otherwise not be available to use in a DVWP. There are several resources that explain how to use server variables, so check those out if you haven’t used them before. A while back I was writing a function using SPServices that would delete a document from a SharePoint library when a user clicked a button. I set up the SPServices function the same way I’d done for other lists, but it wasn’t working. Turns out for documents (as opposed to list items) you must include the FileRef field when selecting what to delete. It took me a while to figure this out because the ID is the only field needed to delete list items. In the first entry to this series, I demonstrated how you can use a data view web part (DVWP) to emit SharePoint® calendar events as JSON that the FullCalendar jQuery plugin can use. Although it works fairly well, there are some limitations to the solution. It doesn’t handle recurring events, it doesn’t retrieve all events, it doesn’t support pagination/bookmarking, and it doesn’t provide a way to connect the calendar to Outlook® or create alerts. This post will overcome the first two limitations by borrowing most of the code posted in this discussion thread on CodePlex and doing away with the DVWP altogether. Jim Bob Howard provided a lot of great information, but it’s broken up over several replies and is a bit difficult to follow. I also wanted to expand on the functionality of his solution by displaying events in the local time zone instead of the web server’s time zone and optimizing the web service calls by retrieving as few events at a time as possible instead of getting a month’s worth of events at a time. 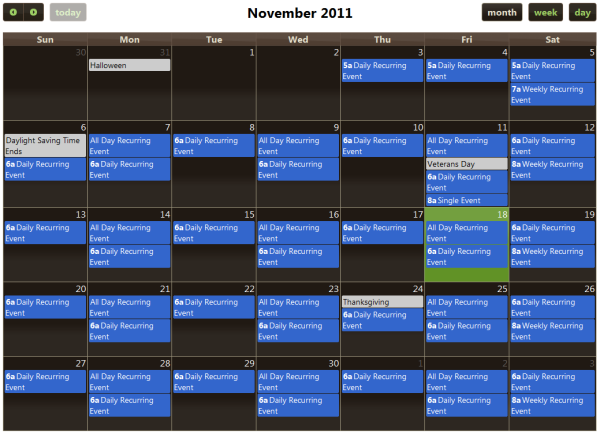 Fullcalendar in all it’s jQuery-themed glory! This morning I was working on a custom list item display form for a “Tags” list that I created in SharePoint (DispFormCustom.aspx). I replaced the standard display form web part with a data view web part (DVWP). For various reasons that I won’t bother explaining in this post, I needed to create a redirect on this page that included an additional tags parameter in the query string with the @Title of the current list item. For example, if a list item has an ID of “1” and a title of “jquery,” I want the page to redirect from http://server/lists/tags/dispformcustom.aspx?ID=1 to http://server/lists/tags/dispformcustom.aspx?ID=1&tags=jquery. As part of a large department site redesign project, I wanted to implement a better calendar solution than what MOSS 2007 gives you OOTB. I remembered coming across the FullCalendar jQuery plugin a while back, so I decided to try using it with the calendar on my department’s site. I haven’t tested this in SharePoint 2010, but it should work just fine regardless of the version (just verify all of the column references in case any of them are named differently). 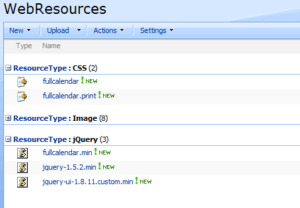 I keep all of my resources in a "WebResources" document library grouped by the type of resource. Once the files were uploaded, I copied the calendar.aspx page and renamed it CalendarCustom.aspx in SharePoint Designer (SPD). Then I switched back to the web UI, went to the calendar settings, and modified the duplicate “Calendar” view so I could rename it and set it as the default (this is the view that will contain our custom calendar). Next I opened that view and hid the default list view web part for the calendar. 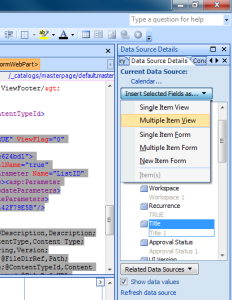 Insert a DVWP with the calendar as the data source, and insert the Title field as a "Multiple Item View." I didn’t want to bog down the browser by loading hundreds of really old events, so I set a filter on the DVWP so that only events with a start time greater than or equal to today minus 90 days would be displayed (see this post for more information on setting up CAML query offsets). This allows people to view events up to three months in the past, as well as current and future events. I also sorted the events by start time in ascending order. It’s based on an ActiveX control, so it only works in Internet Explorer. This alone is reason enough to replace it. When creating a multiple line of text column in a custom list, you can only choose between “Plain text,” “Rich text,” or “Enhanced rich text” as the format for the column—not a lot of options. What if you want your users to have access to headings or other HTML elements? Even the Full HTML RTE that you get on Publishing Pages (or if you create your own site column of this type) generates the same kind of markup. You have a few more options, like selecting basic HTML elements (paragraphs, headings, address, etc. ), but you still can’t customize what appears. A decade ago this RTE would have been really cool, but in today’s standards-compliant, feature-rich web, it just doesn’t hold up. Enter TinyMCE, an open-source RTE with tons of customization OOTB, and even more thanks to numerous plugins (you can even write your own plugins if you need something that it doesn’t have). In this post I’ll show you how I replaced the SharePoint RTE with TinyMCE on my custom list forms using a little jQuery. In a recent project created a page that features several Data View Web Parts pulling information from multiple lists within the site to create a dashboard-like experience. The stakeholders also wanted to be able to quickly search within each list, so I decided to include a custom search box at the top of each data view web part. Recently I needed to create a Data View Web Part in MOSS 2007 that displayed all upcoming events, as well as all events that took place within the last week. The out of the box filtering options in SharePoint Designer (SPD) let you filter a Date and Time column by the “[Current Date]” or by a specific date. Unfortunately the UI does not let you specify an offset for the “[Current Date]” filter, but I found a few resources that showed me how to modify the CAML query that creates the filter to accomplish a date offset. I set up my filter (Common Data View Tasks > Filter) to show all items whose Start Time (aka @EventDate) is greater than or equal to “[Current Date]” to build the initial CAML query. 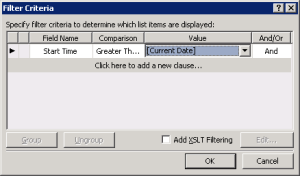 Set the DVWP to filter items based on the current date. Written, designed and developed by me, Josh McCarty.